The not so big secret about me is that I am a witch who is not so great at divination. I’ve never had a very good read on the future, for a very long time I had a very poor read on the present lol. It’s not that I have troubles tapping into the Otherworld, or seeing/feeling things outside of the mundane realm of senses. It’s just I’ve never been very good at picking out on a specific something or someone and where that is leading. Especially with devices like Tarot cards, or runes, or ogham sticks. Is it a lack of discipline? Probably. Lack of interest? Also probably. 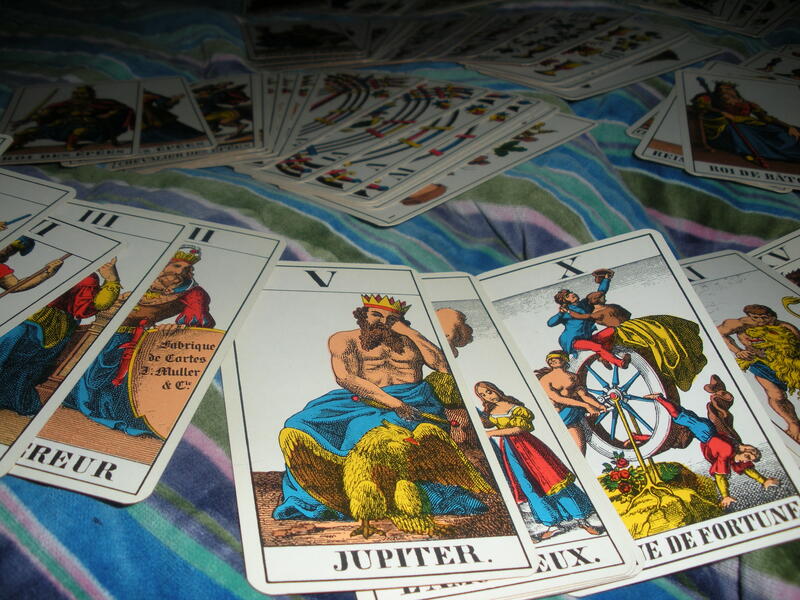 So to that end I’ve never bought a tarot deck, and I still haven’t lol. But I have one despite all this. In fact one just appeared recently. As if by magic. Recently I was emptying out a basket that I needed to collect some hella magical rock from the sea shore. In the process of clearing out this basket was a deck of tarot cards. I have no memory of these cards ever. The basket came from my grandmother’s house, I had rescued it from her closet where it sat in obscurity for probably a lifetime. But I am positive that I had cleared it out then when I found it and there were no tarot cards in that basket then. Yet here they are now. 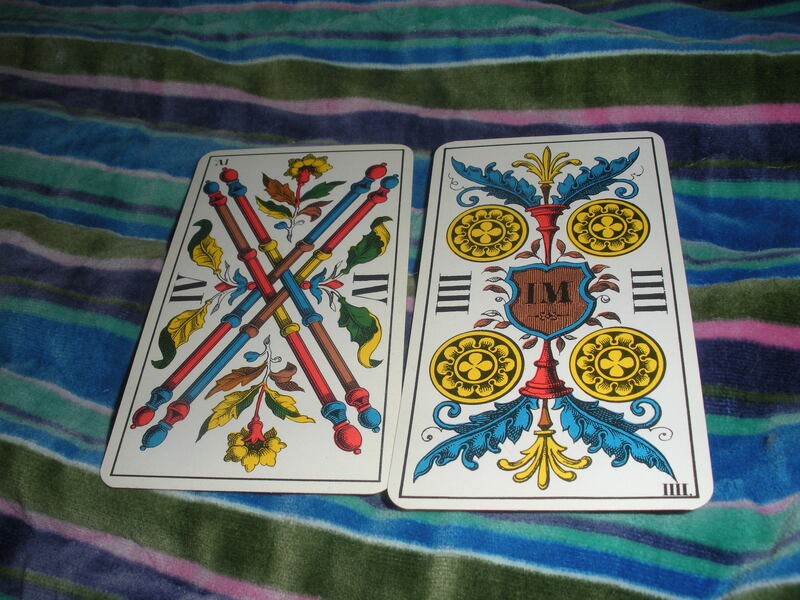 They are an old deck printed in the 1970’s a copy of the 1JJ Swiss Tarot Deck. The first thing that popped out to me was the absences of the High Priestess and the Hierophant, and the presence of Juno and Jupiter. Despite the controversy I have always had a strong connection and liking of Jupiter (both the planet and the deity). Jupiter has always meant good things for me, and despite being a Taurus, I’ve always considered Jupiter my ruling planet (how rebellious of me). I have been thinking about trying my hand in earnest at the whole tarot thing. Mostly because it seems to be a skill that is useful to people. I know that there are many times my friends like to have readings done amoungst them for clarity, and I myself have asked for readings. It seems a shame not to be able to give back. Since this deck seemed to want to be owned by me, I shan’t insult it by not trying. It’s a pretty little deck. All the illustrations are classic woodblock lines, the death card is excellent. It has a worn in feeling to it. Like they know what their doing so I’ll be in good hands if that makes any sense at all. It has history to it which appeals to me, and it’s just odd enough to fit. What do I mean by odd? Notice anything about the below picture? The roman numerals do not match. This isn’t the only case. The Hermit card reads as VIIII, the 9 of cups is the same. While every other suit is the correct IX. Then there is the odd french advertisement on the 2 of coins and the 2 of cups. Little things slight odd. I like it. So we’ll see how this goes. No doubt my Tumblr will see an influx of tarot posts, and I’ll be sure to post here is anything of import happens. Till then we’ll see what’s in the cards.